Life in BG » Rila-y Beautiful! Of course, first you must know a little history (click here or here for more in depth history) of the place. 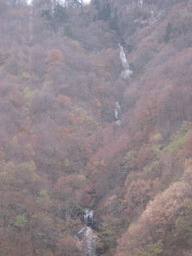 In the 10th Century, a hermit named John lived in a cave and prayed near to where Rila is now located. 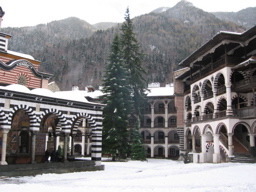 The scholars who followed his teachings began building the monastery, particularly a guy named Ivan Rilski. Many priests and leaders in the world donated to the monastery during the first few hundred years it was built. 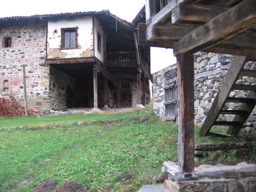 Then the Turks invaded Bulgaria and raided the monastery in the 13th Century. Even so, the monastery was saved by the Russian Orthodox church who would send books and money to the church. 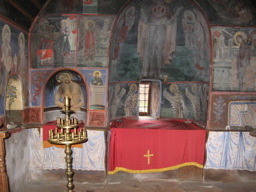 During the time of the Ottoman Empire (when the Turks had taken over), the monastery became a refuge for Bulgarian culture. Because it was in the mountains and a bit difficult to get to, the monks here were able to keep much of the culture alive during this time. 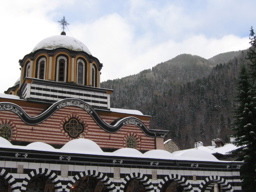 For this reason, Rila Monastery is perhaps the most beloved and respected place in Bulgaria. In the 1880s, as the Turks were being forced out of Bulgaria by the Russians, they burned the monastery down. But…because the respect people had for the place, they raised enough money and rebuilt the place in one year. This may not seem amazing to you, but this is a country that cannot even build a simple road in 5 years, let alone a huge monastery in one! Our trip to the monastery actually began the night before, on our way home from Plovdiv. The taxi we took from the bus station was driven by a guy named Toni. 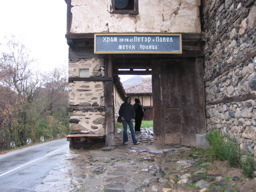 We started asking about going to the monastery because I had read that it is difficult to go by bus in one day. Toni offered to drive us in his own car and we negotiated a price. My two friends, Mark and I split the price. 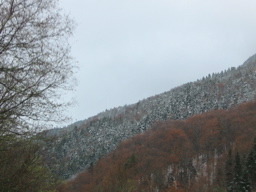 Then we got to the monastery and it was all snowy, in the mountains, and BEAUTIFUL!! Really, truly amazing. 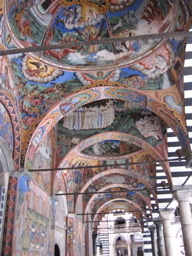 The monastery itself is bright and colorful and every inch of it is covered in artwork and…well….words really cannot convey….take a look! Toni walked us all around, into the monks’ quarters and up to the top to the scenic views, and he even bought us little icons of Jesus and the Virgin Mary. (Soooo nice of him!!! I mean, we were strangers to him!!) Of course, we had to have a snowball fight. Mark thinks he won, but we both know that really, I WON!!! Then we headed down the mountain, stopped for lunch/dinner, and headed home. **There are meeeeeeeellions more Rila pictures in the Gallery, though I removed some of the artwork pictures which were not kid-friendly.